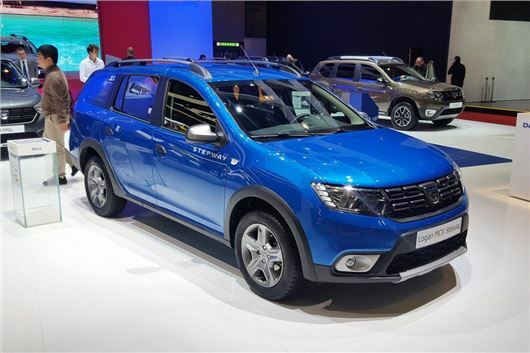 Dacia has launched a rugged version of its Logan MCV estate at the Geneva Motor Show 2017. The Logan MCV Stepway adds crossover styling, with increased ground clearance, bodywork protection and skidplates. It should reach UK showrooms in the summer. ﻿There are no details on pricing for the Logan MCV Stepway, but it will probably match the £1800 premium of the Sandero Stepway and start in the region of £8800. Following in the footsteps of the smaller Stepway, the Logan MCV features beefed up styling, including two-tone bumpers and plastic cladding for the wheel arches and sills. The front and rear also get satin-effect chrome skid plates, along with tail lights that are finished in darkened plastic. Front fog lights and LED daytime running lights will also be fitted as standard. The Logan MCV Stepway sits 50mm higher from the road than the standard model and get 16-inch wheels. It's limited to Laureate trim only, which means all versions will get navigation rear parking sensors, air conditioning, DAB radio and hill start assist for no extra cost. As with the standard model, the Logan seats up to five and boasts a 573-litre boot with the rear seats in place and 1518 litres with them down. The engine line-up will consist of petrol and diesels - TCe 90 and dCi 90 - with both linked to a five-speed manual gearbox. Petrol versions will return an official 55.3mpg, while the diesel will provide an advertised 72.4mpg.